funny this is..you cant simplify it any more than it already is.. FAIL!!! This is also equal to sin(45). They both equal .7071067812. That is just fukkin' Stupid!!! sqrt[1/2] might be what the teach was looking for. Honestly, I blame the teacher for this one. if only life was that simple. Why is there a joke someone made on a site about exam answers...? You can even see it was made in MS Paint. 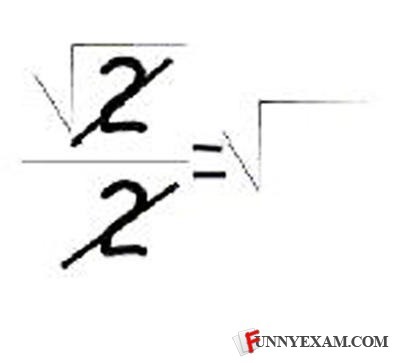 "1sqrt(2) is improper from because you can't leave radicals in the denominator" That would be the numerator. Don't try to be the intelligent man on the Internet if you can't. I think its a pretty funny move. Drop all the math war will ya? damn, that answer is RADICAL! LoL That's So FUNNY !! !! Two guys walk into a bar. You think the second one would've noticed and avoided it.